Regi Boehme, noted NDT instructor, offers practical treatment ideas in this revised edition of her work shop manual. This easy-to-use reference tool gives you an understandable overview of basic problems of low tone. The Neuro-Developmental Treatment approach is included in the illustrated treatment rationale. 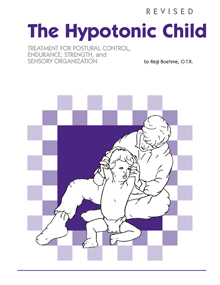 This "hands on" resource includes early diagnostic signs, quality of postural tone and its impact on movement, principles of NDT and its relationship to hypotonicity, effective sensory-motor input, and suggestions for carryover at home. Clear line drawings and descriptions will help you understand conditions and treatment techniques.